Find an IDE hard drive duplicator can help you duplicate your IDE hard drive to SATA disk in the fastest way. And the AOMEI Backupper is such a hard drive cloner which can help you. IDE, the short for Integrated Drive Electronics. IDE hard drive integrates the controller and disk body, IDE is the transmission port of the hard drive. Apparently, PCs’ hard drives are all compatible with IDE, it only need to connect them with the mother board or port with a cable. IDE hard drive is easy to use, and it is cheap, and there are still so many PC using IDE hard drive. However, more and more users would like to upgrade IDE hard drive because it has many disadvantages such as its slow running speed; it only can be used internally installed; it has a very strict restriction with the length of the cable, etc. Why you need to duplicate IDE hard drive? If your computer with IDE hard drive becomes very slow, you can change your IDE hard drive with a SATA HDD or SATA SSD since SATA port has many advantages over IDE port. To change IDE hard drive to SATA disk, you can do a fresh install with Windows installation disk, or clone IDE hard drive to SATA disk without reinstalling Windows and applications. Obviously, clone hard drive should be a better way, which will save a lot of time from a fresh installation. To clone IDE hard drive to SATA disk, an IDE hard drive duplicator would help a lot. There are so many IDE hard drive duplicator in the world. 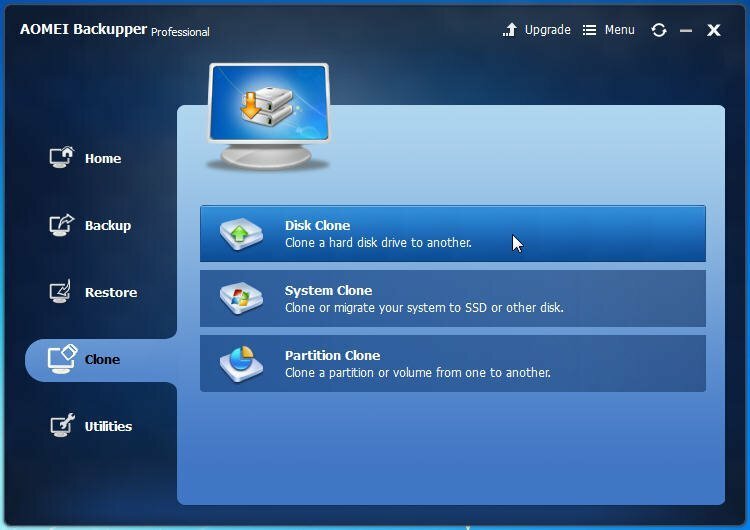 Comparing the features and price ratio of many software, here we highly recommend you AOMEI Backupper, which should be the best IDE hard drive cloner, can help you clone IDE hard drive to a SATA HDD/SSD simply, and you do not need to worry that whether the cloned hard drive will boot fine after cloning. Let’s see how to clone IDE hard drive to SATA disk with AOMEI Backupper. A SATA HDD or SSD. A computer running with Windows 10/8/7. Make sure your computer’s mother board supports for SATA. If it does support, you only need to prepare a SATA cable and power cable to connect the SATA disk to your computer. If it doesn’t support, then, you need an IDE-to-SATA adapter for connecting you SATA disk to your computer. Install AOMEI Backupper to your Windows computer. Then, you can start to clone IDE hard drive with this great IDE hard drive duplicator. Step1. Connect your new disk to your computer using the cable, make sure it can be detected. Then, launch AOMEI Backupper on your computer. To clone IDE hard drive, here you need to selectClone->Disk Clone. Step2. Then, choose the IDE hard drive as the source disk. 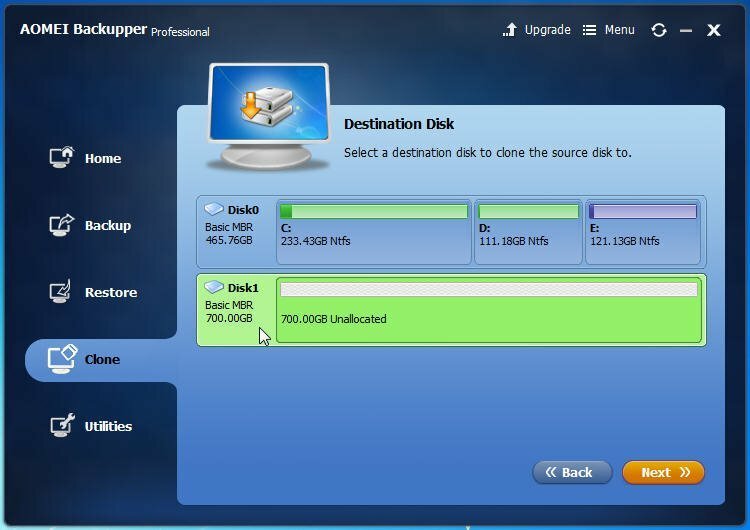 Step3.After that, you need to choose the SATA disk you prepared before as the destination disk. Step4.Then, you will move into the final page. Confirm the whole progress. If there is no problem, click Start Clone, and it will be executed immediately. You can edit partitions on the destination disk as you want by opening the settings icon. If you check the box of “Sector by sector clone”, you cannot clone larger disk to smaller disk anymore, cause it will clone every byte on the old IDE hard drive, which need the destination disk must as large as the IDE hard drive at least. If your destination disk is SSD, it would be the best of checking the box in front of “Align partition to optimize for SSD”, because it will optimize the performance of the SSD after cloning. In a word, AOMEI Backupper should be the best IDE hard drive duplicator. It cannot only clone IDE hard drive to SATA HDD/SSD, but also can clone IDE hard drive to another IDE hard drive, or some other external hard drive. If you only need the system files on your IDE hard drive, you can only clone system on the hard drive with its System Clone feature. Besides, it provides you many other functions, such as, if you need a bootable disc, you can use it to create bootable disc; if you need to system repair disc, you can use it to create system repair disc; you can even use its backup & restore functions to backup IDE hard drive first, then, restore system to dissimilar hardware and boot from the new hardware, etc. With the great powerful features, it should be the best IDE hard drive cloner.